Will You Still Need Me, Will You Still Feed Me, When I’m 77? The holidays are supposed to be a time of happiness and a renewal of faith in the innate goodness of humanity. I have to say that for us it was a mixed bag. We got a call from someone (we’ll call him Mr. Rescuer) just before Christmas. 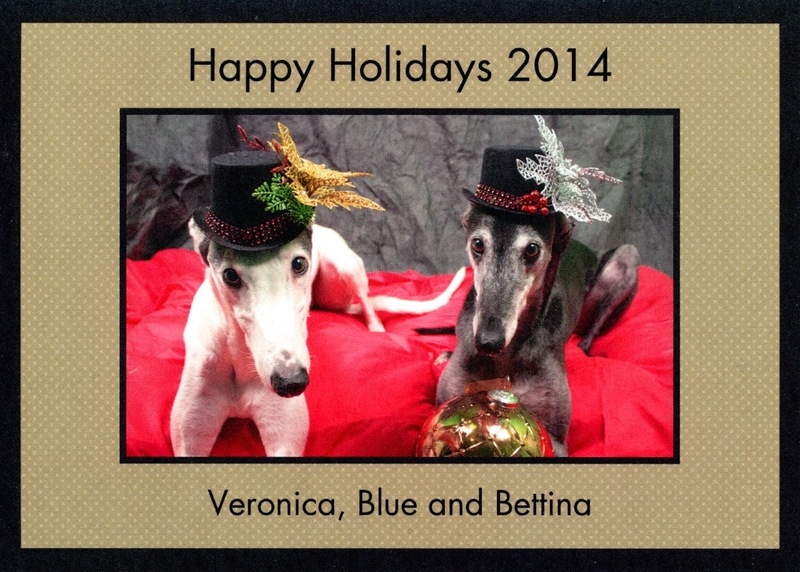 He had gotten our number from a friend of his who lives near us and knows we are involved with greyhounds. sleeping in your refrigerator for a night with no clothes on. 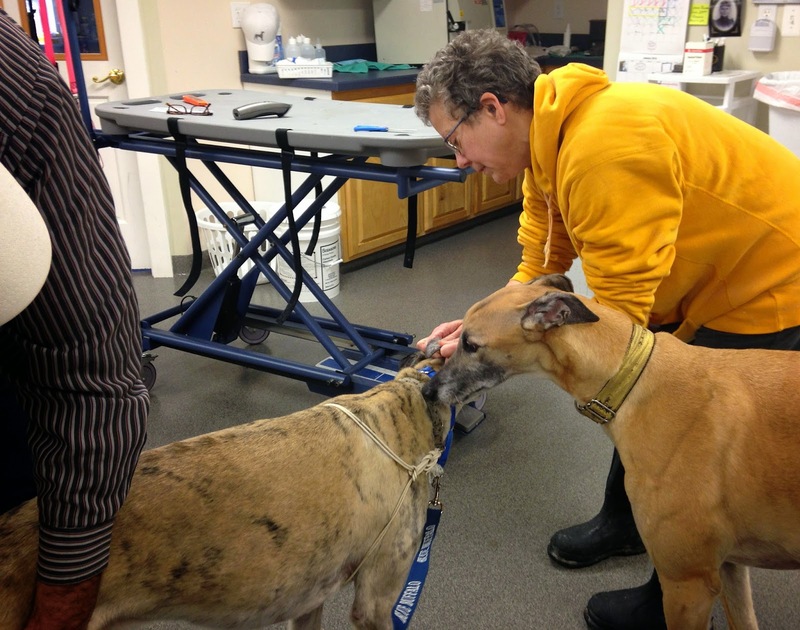 After speaking with Mr. Rescuer, he said he had no problem keeping the lost greyhound until after Christmas. 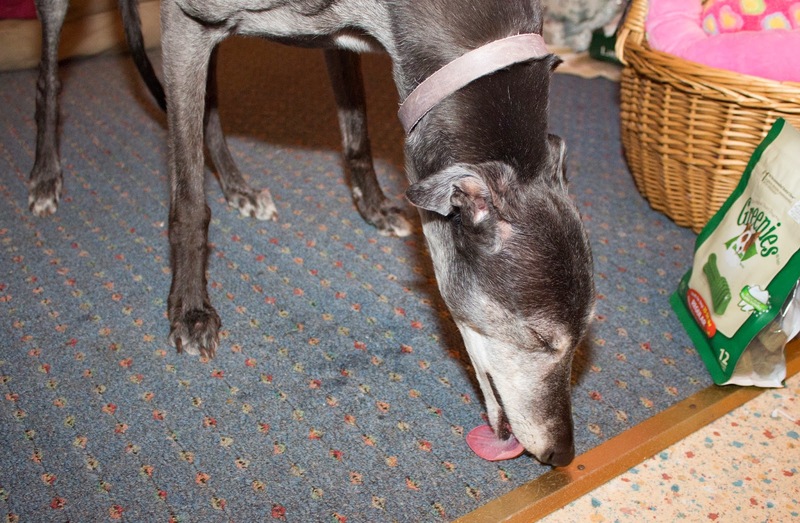 The greyhound was warm and safe and being fed. They had taken a shine to him. After Christmas we arranged for the kids and I to go and pick up the hound. 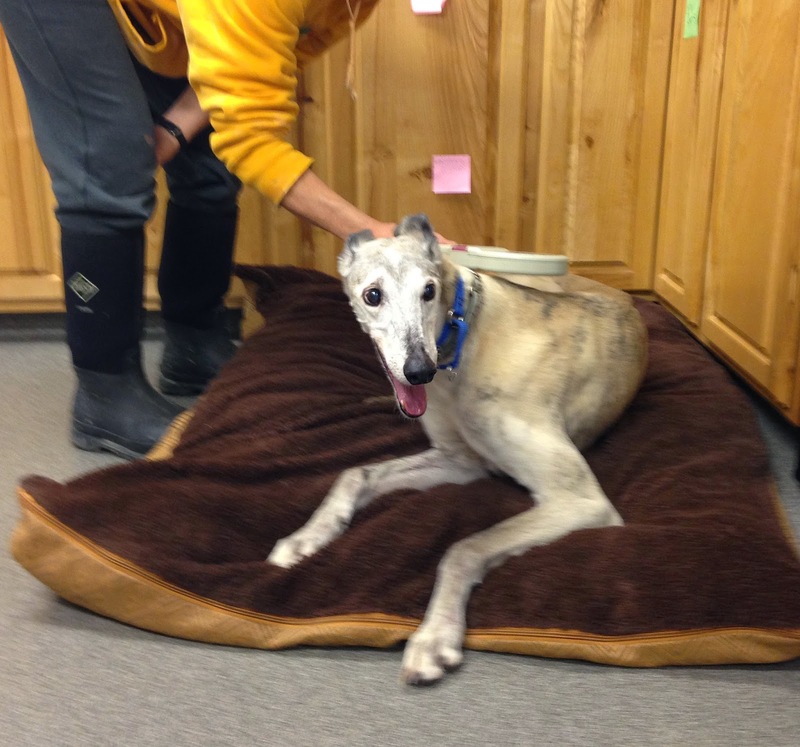 We would transport him to the Maine Greyhound Placement Service where he would be identified and cared for. Things are always a little less scary with a friend. We arrived on the appointed day and time to meet the wandering grey and got our first shock. He was a sweet, sweet old grey. He had cataracts and a white face. When I was finally able to get a look at his ear tattoo, I discovered he was 11 years old. He was also clearly underweight with bones and ribs poking out all over. His nails looked like they hadn’t been tended to for some time. None the less, he was a happy boy and had taken a liking to Mr. Rescuer and Mr. Rescuer’s father. I think the liking was mutual but unfortunately Mr. Rescuer had an elderly cat and they did not feel they could disrupt the cat’s world by moving a canine into the house. They were definitely sorry to see this loving baby leave. 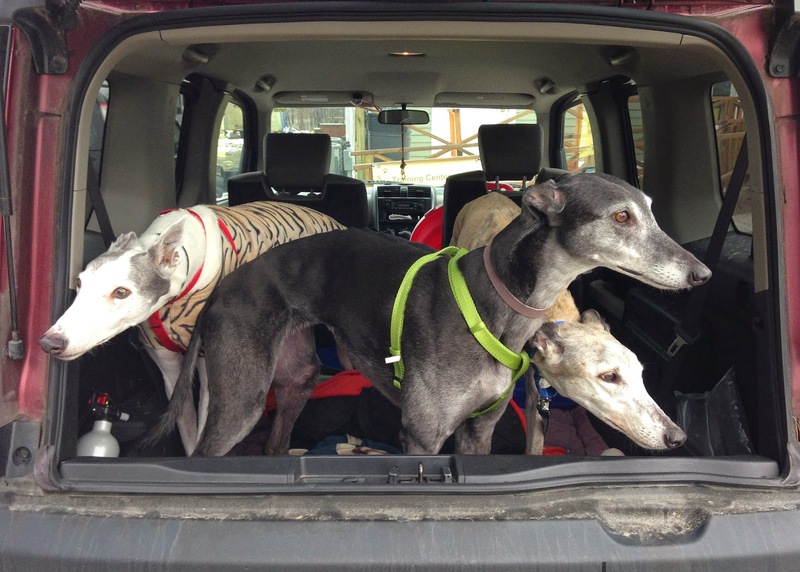 But the greyhound didn’t balk at all about hopping up into my car with Blue and Bettina as company. That was how Mr. Rescuer got him home. He opened his truck door and invited the wayward grey to jump in, which he did. 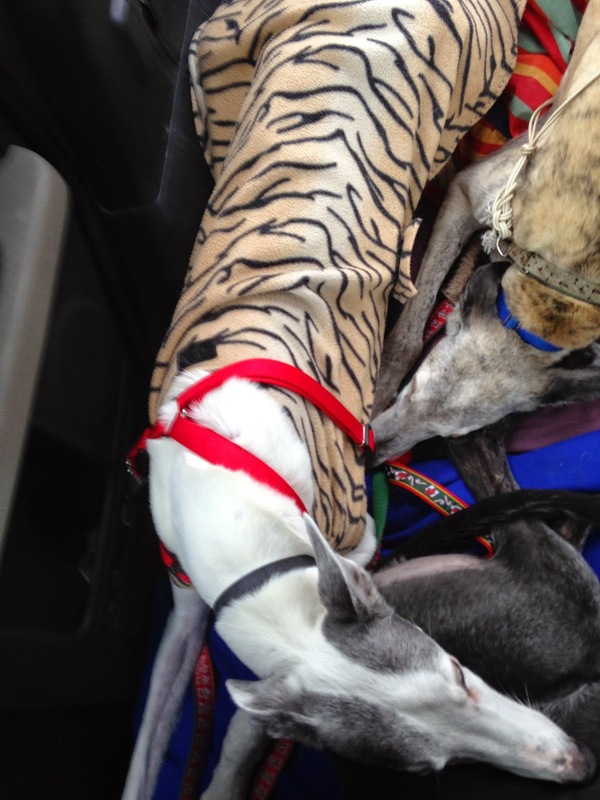 As we were driving to MGPS, Blue, Bettina and our guest got comfortable with each other and soon were curled into one big pile with three heads and three tails. The folks at MGPS were awaiting us when we arrived. And if 1 friend is good, then 2 friends are better! The first thing they did was weigh this poor old fellow. He weighed in at only 60 pounds. He was slightly smaller than Blue but Blue weighs in at 75 lbs and I keep him on the thin side. This old guy should have been somewhere between 70-75 lbs. He was at least 10 lbs lighter than he should have been. On a greyhound that 10 lbs makes a big difference. Winslow gets checked over by everyone, including Cider. Winslow held court from the bed, not moving from it during the time I was still at MGPS. 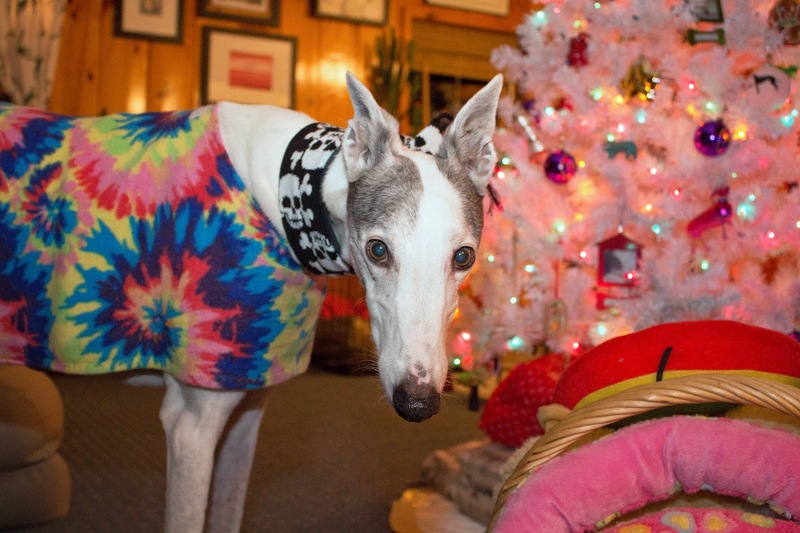 We learned that not only was Winslow 11 years old, he had raced in Raynham MA and had first been adopted in 2007. Blue is 11 years old and HE raced at Raynham as well (probably they raced there at the same time). I adopted my Big Poppy in 2007. 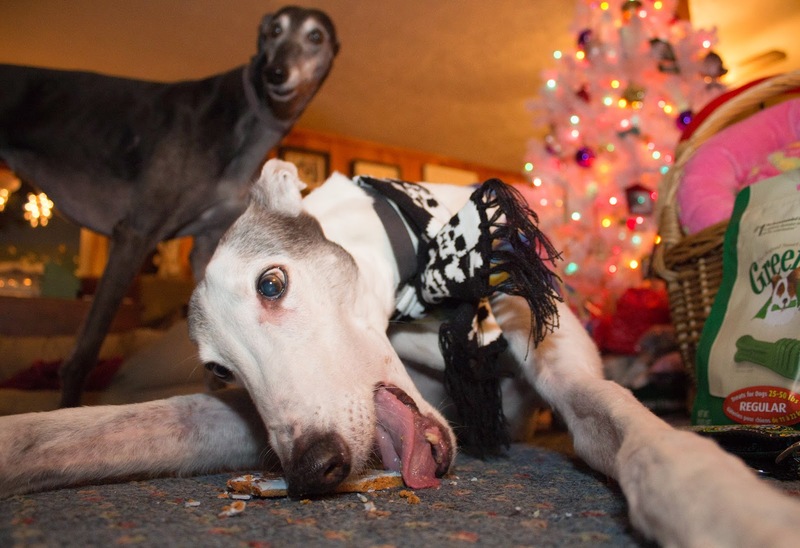 The parallels between this poor skinny neglected hound and my own best boy were so striking. 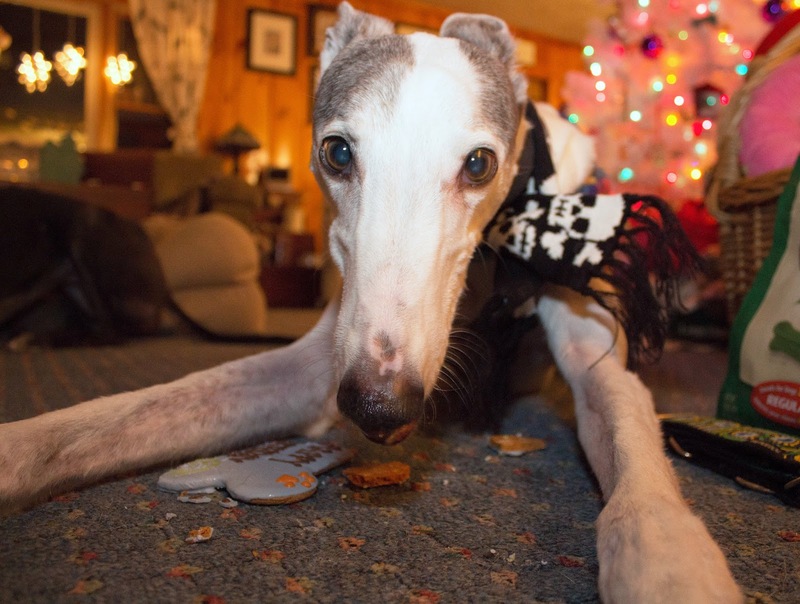 Since I cannot ever conceive of doing such a thing to any hound in my care let alone an 11 year old who had been nothing but loving, I felt pretty sick to my stomach that anyone else would. A soft place for old bones. house in the winter and a coat and snood over that when he goes outside because his old bones get cold so much easier than a younger hound. He has memory foam bedding to make sure he’s comfortable. He has an electric blanket in his crate to make sure he stays nice and warm at night. 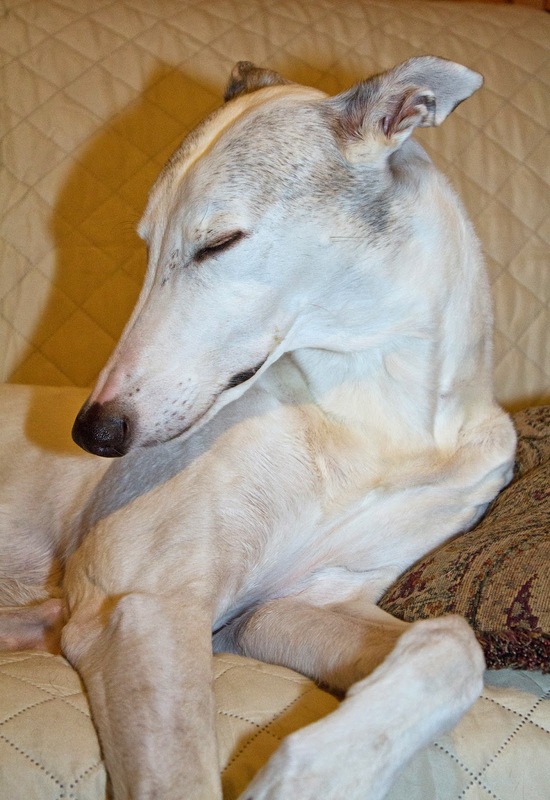 Any greyhound who reaches the venerable age of 11 deserves to be pampered and loved an extra measure. How could someone be so cruel and so heartless to put any dog out like that, let alone one who is more vulnerable because of his breed and age? We got a call from MGPS later that day after we had returned home. They let us know that they had tracked down and spoken with the original adopters and pieced together a story of divorce and the handing off of Winslow to someone else who clearly didn’t care for the dog. Winslow will stay at MGPS where he’ll be fattened up and spoiled for awhile and then put up for adoption. If there is any sort of god, Winslow will spend his last years in a loving home being spoiled rotten. Good things will come to Mr. Rescuer and his father for saving Winslow from a worse fate. 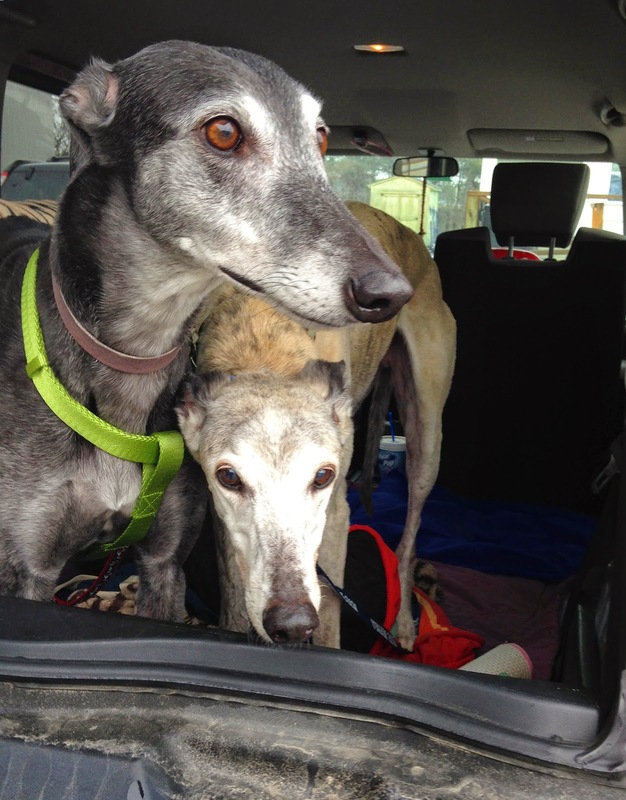 And there is a special corner of hell reserved for whoever turned that greyhound out into that freezing field. Post Script: There has been more contact with the person who took Winslow after the divorce. He says that Winslow escaped during a visit from the UPS man. He has offered to pay treatment and dental costs and any other costs to have him returned. I have some personal doubts about how hard anyone searched for Winslow given at least 2 days having elapsed since his escape and 5 more days elapsing while in the care of Mr. Rescuer and no posters up as well as his being so underweight and teeth and nails neglected. But it certainly can happen that a moments inattention can result in something terrible like this happening. I hope for Winslow's sake, and for the sake of my faith in humanity that this is all true and it has a happy ending. On December 10th my Big Poppy turned 11 years old. We've had a discussion and I've let him know that his goal now is 19 years. I thought about 20 years but I didn't want to get greedy. So 19 years it is. And when we get to 19 years, what's one more year? 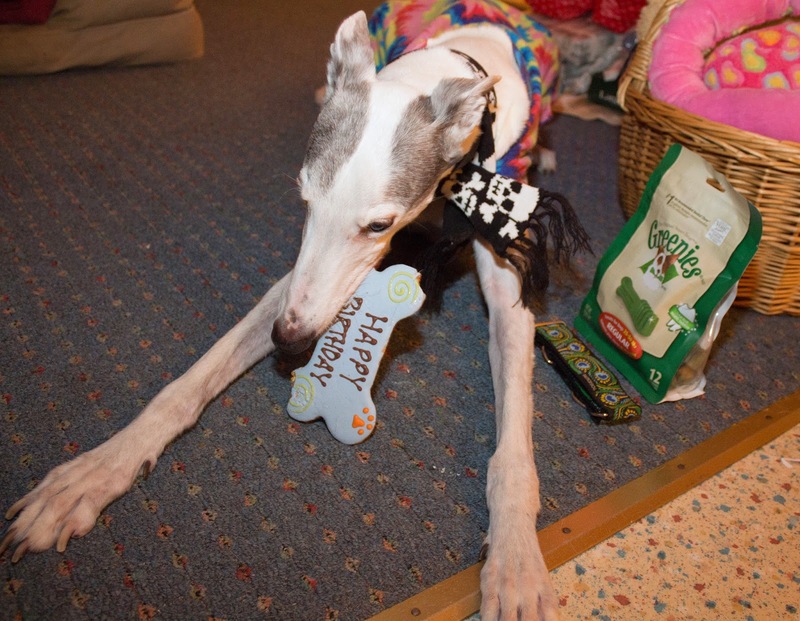 We celebrated that evening with a big birthday cookie and some presents including his most favorite of all, Greenies. In honor of the 11 years Mumma decided to forego a silly birthday hat. But I make no such promises for his 12th birthday. About to punch the paparazzo in the face. Bettina photo bomb. "Ummm, where is my cookie?" It's just a scarf Mumma. Not a fashion shoot. What's a girl got to do to get her own Big Cookie? What? I had one in October? I'm QUITE sure I would have remembered that.